In digital text communication small symbols are becoming increasingly important. What emojis do Germans particularly like to use, and what influence do they have on our language? The Germans are fretting about their language. Why, asked the journalist Johanna Adorjan recently in the Frankfurter Allgemeine Zeitung (FAZ), can we hardly do without small pictures when we come to write in everyday life? Twitter, Facebook, WhatsApp, SMS: a great mixture of texts, faces and symbols. Are we forgetting how to express ourselves in words? Do we credit our sentences only when they are garnished with mini-pictures? We are talking about emojis (Japanese for “pictograph”), small, stylized images, faces, hands, vehicles, food – the list gets longer year by year. Their presence in the everyday communication of Germans is now in fact so great that we may well ask what we are really dealing with here. With a new language, a modern hieroglyphics even, which may soon dispense completely with texts? That these developments are viewed critically, particularly in Germany, does not surprise him. “The thesis of the deterioration of language has haunted the public for decades.” But for this apprehension, according to Beißwenger, there has never been really good reasons. “Language isn’t an abstract unity for whose quality we’re responsible as language users. It’s always at the service of the language user.” It therefore would be absurd to assume that our main medium of communication has so changed that it can do less than before. “The opposite is the case.”If we follow the philologist Beißwenger, emojis, in their capacity to make written texts more dialogical, are at bottom a communicative enrichment. That people use pictographs to this purpose, by the way, is nothing new. The idea is as old as the medium that first made possible this new form of writing: the networked computer. When in the early 1980s people began to communicate on online forums, they soon noticed that there was a problem about distinguishing between, for instance, serious and ironic messages. The American computer scientist Scott Fahlmann found the solution: a smiling face lying on its side, consisting of a colon, hyphen and parenthesis served as a sign of humor or irony. The now famous “smilely” was the first “emoticon”. The faces composed of signs stand for a specific emotion – hence their name, a combination of “emotion” and “icon”. Unlike emoticons, emojis are independent pictographs whose repertoire extends far beyond only faces. They were developed in the late 1990s by a Japanese software engineer as a gimmick to attract young users to a pager app: 176 pixel images inspired by manga culture and calligraphy, including a pout and a light bulb. In 2010 the symbols were incorporated in the so-called “Unicode”, a worldwide standardization of characters and text elements, designed to ensure platform and device-independent communication. 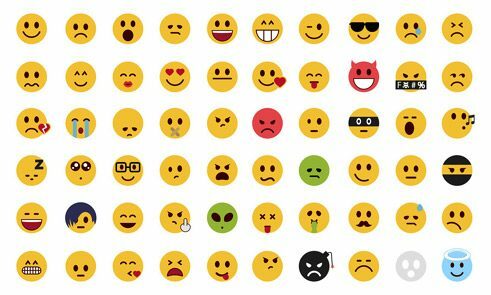 Since then, year for year, more and more emojis have surfaced, especially in chats, e-mails and online forums. Advertising agencies, newspaper editors and publishing houses have also experimented with the new symbols. For Beißwenger emojis are a fascinating field of research. The philologist is part of the project team Whats up, Deutschland?. This research project of the Technical University of Dortmund studies, for instance, the use of emojis in texts of the short message service WhatsApp. The first results are expected in the spring of 2016. Already out, on the other hand, is the study of the British software company Swiftkey. In April 2015 the keyboard app developer for smartphones and tablets published the emoji use of about one million users from sixteen countries. Celebrated by the media as the first worldwide emoji report, the data indicate above all country-specific preferences, albeit with certain room for interpretation. According to Swiftkey’s analysis, Germans, like all other nationals, sent mainly positive emojis, namely laughing faces. In second place came hearts in all variations, and near last place sad symbols. At the very bottom are hand gestures such as clapping or the peace sign. And when it comes to money icons, the Germans, along with the French, bring up the rear. In addition, it was discovered that in the category of mammals Germans preferred a mouse. But what significance have these results? Are we, asked the German press, cheerful, easily amused bores?